Thermaltake, as the pioneer who incorporates RGB lights into PSU, has launched the Thermaltake Smart Pro RGB Bronze Series, coming with a pre-installed, patented Riing 14 RGB fan with 5 lighting modes to choose from and built-in memory. Featuring capacities ranging from 650W to 850W and 80 PLUS Bronze certification, Smart Pro RGB Bronze Series adopts the high quality components and fully modular design that always accommodate any mainstream build under any circumstance. By pressing the RGB lighting button, the fan color can be switched among an RGB Cycle with variants including Solid Red, Green, Blue, White, and a LED Off mode. The fan is also constructed with a built-in memory function, saving the color applied and insuring the same color selection every time you boot your PC. With the face-up placement of the fan, users can freely gaze upon their patented RGB fan and at the same time obtaining additional performance by using the fan as a additional exhaust mechanism, repelling unwanted heat from your chassis. As the thermal image testing shown, the temperature of PSU and computer system will decrease around 3°C (5.4 °F) by placing PSU face-up. Smart Zero Fan ensures zero noise when the fan operates below approximately 10% working load to minimize audible noise. The fan will operate when the power supply working load over 10%. A switch is provided for those who prefer the fan to spin constantly. All ripples are lower than 50mV for high stability on +12V, +5V, or +3.3V from 0% to 100% load to ensure a high quality power supply. Low ripple noise will keep your performance-critical components, such as high-end graphics cards, to operate reliably for longer. The voltage regulation of the PSU is set to no more than ±3% for major rails to meet the greater performance. The strict voltage regulation of the Smart Pro RGB Bronze Series is better than Intel’s standard ±5% for major rails and ±10% for -12V. High quality 105 °C (221 ° F) Japanese brand main capacitor which greatly improve the durability and offer the highest stability and reliability. 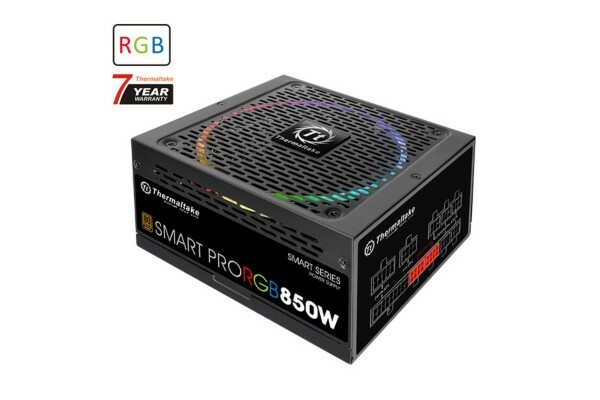 Smart Pro RGB 850W Bronze is equipped with a powerful single +12V rail, eliminating the limitations caused by voltage distributions, delivering the power your CPU and VGA demand in any situations. Besides, with DC to DC design, the unit optimizes maximum energy harvest for computer systems, providing the best compatibility, conversion efficiency and stable voltage output. Smart Pro RGB 850W Bronze offers cable selection for users while powering the system at an advantageous voltage. Low-profile flat black cables can make cable management easier, reduce clutter and increase airflow inside the chassis. Deliver up to 85% efficiency under real world load conditions to promise lowest power losses. Additionally, Smart Pro RGB 850W Bronze has been optimized to work with Intel’s latest, Sixth-generation Skylake processors to achieve maximum energy saving. Smart Pro RGB Bronze Series is the best idea for users to go with when they are looking for an RGB PSU which permits remarkable functionality and aesthetics in all cases, especially Open Frame or Tower cases. Efficiency Meet 80 PLUS® Bronze at 115Vac input.